On March 11, 2011, the Japanese government began what was believed to be a temporary evacuation of residents who lived in the area surrounding the Fukushima Daiichi nuclear complex. On March 12, and again, on March 15, the evacuation was expanded in size after several hydrogen explosions at the plant's reactors. The evacuation zone, altered several times since 3/12, now includes eleven towns and extends up to 45 km from the nuclear meltdowns. Hundreds of thousands of evacuees were forced to leave behind many thousands of animals. Initially the severity of the nuclear disaster was downplayed, leading residents to believe that their evacuation would be short-term and temporary. Thinking they could come back and get them soon afterwards, evacuees left pets and farm animals with enough food and water for a few days. Animals left behind included dogs tied in backyards, cats in locked homes, and farm animals confined in barns and pens, without the opportunity to escape to forage for food and water. Animal welfare groups that were scrambling to attempt to feed and save animals throughout Tohoku's earthquake and tsunami-hit area also tended to and rescued animals within the overlapping nuclear exclusion zone for the first few weeks of the evacuation. However, animal rescue was impeded when Tokyo enacted a strict “Do Not Enter” policy on April 22, 2011. Yoko Mieko, who lost four of her twelve cats during the disaster started a campaign for the rescue and care of animals left behind. She regularly went into the exclusion zone to feed and rescue animals. On June 30, 2011, the cram school teacher issued a video plea, "Cry from Fukushima: Help animals around the nuclear plant" on YouTube. Some individuals and animal welfare groups sneaked into the zone to attempt to feed and save animals. 1,500 dogs and cats were rescued the first six months. Nine months later, when the severity of the nuclear meltdowns became undeniable, and the public realized that the temporary evacuation order would not be lifted as they were initially led to believe, the Japanese government gave into pleas from rescue groups asking that they be allowed to save any surviving animals from freezing to death during the winter. 16 humane groups were permitted to enter the zone from Dec. 7 to Dec. 27, 2011 where they were able to rescue some animals among the thousands they found starving, ill, and dead. The United Kennel Club Japan (UKC Japan), was one of the groups that helped in this highly publicized rescue of hundreds of animals. UKC Japan is now caring for many of these animals at its shelter in Tokyo. After some disturbing film footage of the rescue was aired on television, the Japanese government decided to refuse animal rescuers further entry into the zone, going so far as arresting Hiroshi and Leo Hoshi on Jan. 28, 2012, for not heeding the no-entry order. 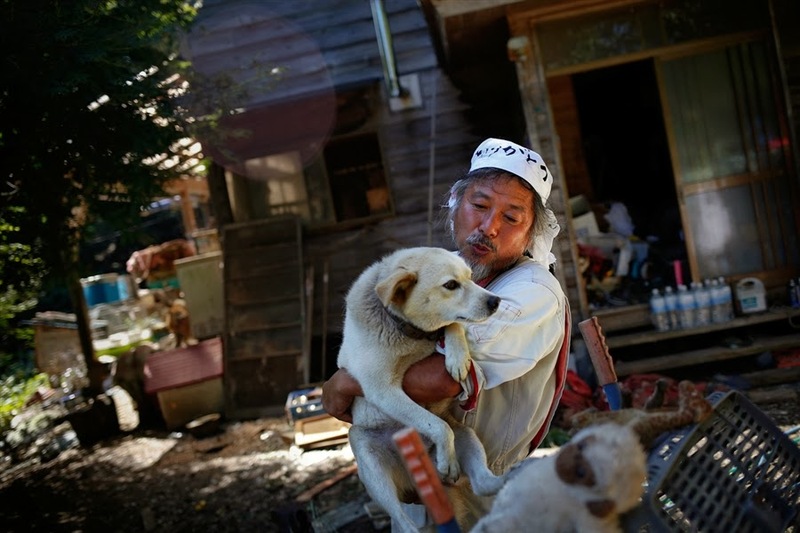 The Hoshi family, at their own expense, had rescued over 200 animals. The Hachiko Animal Federation is sponsoring a petition asking for their release, with the plea to Chief Prosecutor Toru Sakai, that such a release on humanitarian grounds would be just in that there was no criminal intent; the Hoshis were simply unable to witness suffering animals and do nothing. The compassionate and heroic work of Keigo Sakamoto (and that of others who also stayed to care for animals left behind; residents who regularly visit their former homes to care for animals; Japanese and international animal welfare groups; and countless individuals in Japan and around the world supporting the humane treatment of natural and nuclear disaster animal victims) are some of the jagged silver lining stories of post-3/11 Japan.